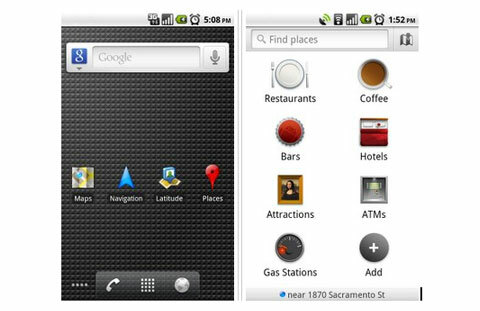 Google Maps is one of the most useful services from the company and it’s also one of the fastest updated ones. It has received six updates in six months and has just launched the next one for Android 1.6: Places. As the name suggests, it’s a new application that allows users to search and find local places around them a little easier. You can look for all sorts of local sites such as restaurants, bars, gas stations, malls and whatever may be your requirement. Several detailed features included in the app allows you to create your own categories so that if you look for the same place, e.g. the nearest gas station, in every new area you drive to, you’ll be able to do that quickly and easily without going into too many details. Search results will also show business hours for a particular place, distance and compass direction, parking spaces, check out prices and even restaurant menu links, all of course depending on the expanding data base of Place Pages. The app runs on Android 1.6 and later versions; it’ll be rolled out to BlackBerry users in the update scheduled for the next month.